Recently restored, Shopkeeper's House has come a long way from its origins as a humble fruiterers and grocers. Now a delightful 2 bedroom country getaway, it's the perfect place to stay and experience a bit of Maldon heritage. The house has been carefully rebuilt and decorated so that it's super-cosy in winter and cool in summer (and there's always the option of firelight with the wood-fired heater). The 2 queens size beds, modernised kitchen and contemporary bathroom carry the vintage feel while quality linens and bespoke supplies hint at a little more luxury. Curl up with a good read, spin a disc or play some games; stay by the fire in winter or relax on the lawn in the shade of the enormous ash tree in summer. Shopkeeper's is a great base to stay in or to explore the region. We love our area, so please ask us for ideas! And if it's activities you're after, nothing beats cycling or hiking the local trails, or catching the steam train into Castlemaine. From the luscious linens to the local Coffee Basics fresh roast, everything's here to help you relax, soak up those country vibes and restore that inner balance! 2 night minimum stay except festival weekends. Pets welcome by arrangement (please note that a $50 cleaning fee applies). We want Shopkeeper's to be your slice of country Victorian heaven! Why this home? Because it's such a distinctive feature of the town, one that everyone knows and loves. We love that it has a former life as a shop with its distinctive shop window. It's comfy and modern in all the right place, and has lots of vintage and antique bits and pieces that reflect our interests. It has lots to keep you occupied here - but it's also so close to town, and right at the start of the Maldon-Castlemaine trail if you're feeling active. And we love that it's right by the station, with the choof of the steam as it comes and goes, and that horn tooting in the distance - we're sure you will too! The Shopkeeper's House you see is the outcome of extensive restoration and rebuilding. 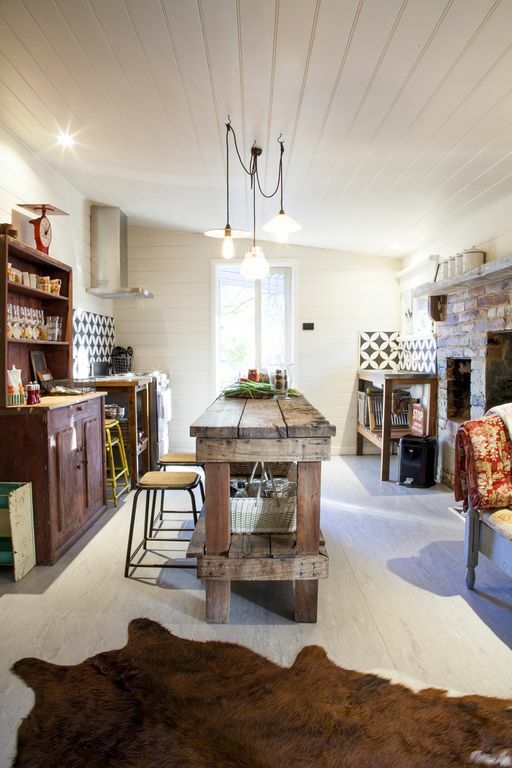 The funny little old cottage that was about to collapse has become a lovely place to be, with heaps of care and attention to detail that has made it the special experience it is. It's where the best of old Maldon, meets modern needs... A quirky old cottage with a wet room and modernised kitchen; a turntable to spin a disc of jazz or bluegrass; those beautiful linens and antique quilts and fabrics. And of course the location, with walking trails into the reserve, or into town, right at your doorstep. 1 in the drive + safe parking behind the house. Wood fired solid fuel heater in the living area. Novels, interesting coffee table reads and great magazines. All sorts of board games, cards and some outdoor games. Large lawn area under a shady tree. Absolutely loved our stay. Great relaxed getaway. Glad you enjoyed your Christmas stay, Melissa - I'll make sure the aircon filter isn't overlooked next time. Look forward to hosting you and your dogs again! Beautifully restored /renovated cottage with many nice homely touches and amenities. Such a perfectly restored little place and the attention to detail is amazing. Filled with activities for all seasons, we couldn’t have asked for a better place to stay. Thankyou April! So pleased you enjoyed your weekend. Look forward to having you stay again on your next visit to Maldon! Lovely character filled cottage. Cosy fire lit on arrival. Has everything you need. Short stroll into historic Maldon. Wish we could have stayed longer. Relaxing, comfortable cosy and plenty of history. Beautifully renovated. Thanks for a memorable weekend with friends. Thanks Danni, glad you both enjoyed your stay! My wife & I loved how cosy the cottage was, so well fitted out and comfortable. Thoroughly recommended for a weekend’s getaway to a town with great coffee & cake spots and quality restaurants. Thanks for making us so welcome Jamie. Glad you both enjoyed your stay!